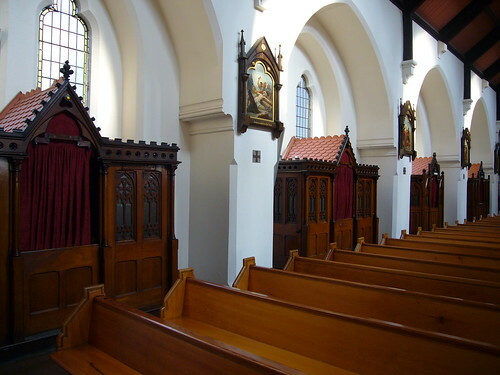 At Saint Mungo’s we hear confessions every day of the week except Sunday. Each of us has a day “on duty”; my day is usually Tuesday, but this week I had to go with someone to the hospital on Tuesday, so I was hearing confessions today. 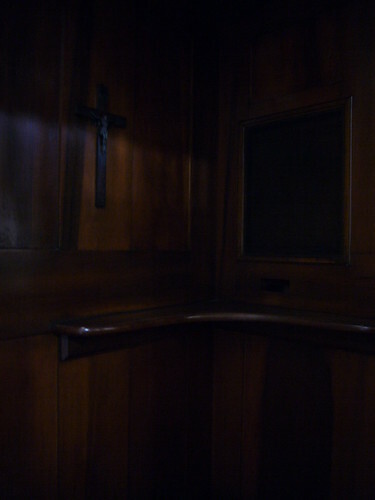 As well as being well-constructed and moderately comfortable from the confessor’s point of view, these Victorian confessionals are a real feature of the interior of our church, partly because there are so many (-there are eight of them) but also because of the beauty of the materials and design. What kind of people go to confession? The short answer is Catholics. 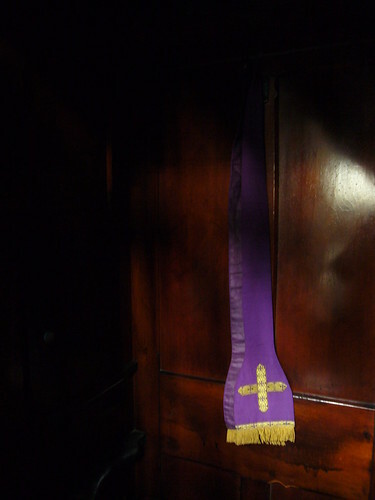 In this church, people of all ages go to confession, not just older people; we hear more confessions of men than of women (probably three or four to one); there is also a great maturity in the way most of the penitents approach the sacrament. In spite of what you may read in the papers about the decline of Catholicism, lots of people pray every day, like to go to weekday Mass, set aside time each day for spiritual reading, and seek to grow closer to God through the Sacrament of Reconciliation. For many people, the Mass is the centre of their spiritual life, but the confessional is their opportunity to be personal. The anonymity of this wooden box allows people not just to confess their sins but to share their burdens, to ask serious questions, to express their deepest feelings, and to open to God their most profound needs. In their life span of more than a century, how many life-changing encounters with Christ have these confessionals witnessed? Father Nicholas Schofield, who is Archivist of the Archdiocese of Westminster, has added a fine Roman (and Passionist) picture to the top of his blog Roman Miscellany. He writes: I took the shot in Rome in January – it is the view from the Circus Maximus of the Celian Hill, including the facade of San Gregorio Magno (the seedbed of the English Church) and the campanile of Santi Giovanni e Paolo (where St Paul of the Cross is buried). 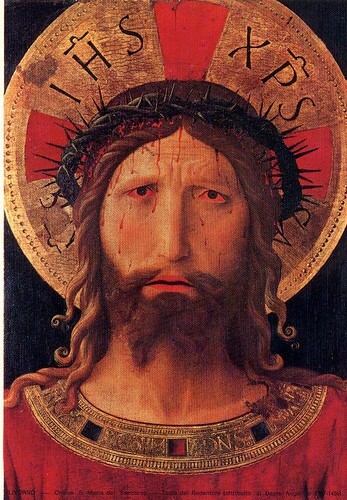 This painting of Jesus Crowned with Thorns, which is in Livorno (known to John Henry Newman and his generation as Leghorn), is attributed to Fra Angelico. It was exhibited at the Metropolitan Museum of Art in New York in 2005, where one reviewer described it as the most arresting painting in the exhibition, and perhaps in all of Fra Angelico’s career. The reproduction, although striking, doesn’t do it justice; I can remember the hair standing up on the back of my neck when I saw it for the first time. One of the amazing things about the painting is the bloodshot eyes of Christ, showing the intense suffering of the Passion and at the same time the openness of the love of God which is revealed in the Passion of Jesus. What is the means to be used to overcome our passions? It is to meditate on the Passion of Our Lord. A person who is proud, for instance: if he sees that Jesus Christ is derided, mocked, sent from one place the other and keeping silence, he sees a great motive of humility in Our Lord. Another is impatient: he may look to the Crucifix and he will find a model of patience. I was at province meetings in Dublin yesterday, after waiting an hour at Glasgow Airport for the fog to lift. Our Passionist Charism and Spirituality group is preparing a Province Youth Assembly which will be held at the Emmaus Retreat and Conference Centre, near Dublin, from Friday, 6 July (evening) to Sunday, 8 July (afternoon). This will be an opportunity for young people who are associated with our communities and parishes to come together and deepen their awareness of the message of Saint Paul of the Cross that the Passion of Christ is the most overwhelming sign of God’s love. It will also be a part of our preparation for the World Youth Day in Sydney in 2008, as a number of those taking part in the Province Youth Assembly will be going to WYD as members of the Passionist pilgrim group. After the meetings, I had a chance to talk with Father Frank Keevins about the preparations for the Canonisation of Blessed Charles of Mount Argus, but more about that later. Good news today from Father Kieran; he was at the hospital this afternoon and the surgeon is very pleased with his progress. He hopes to travel home to Ireland at Easter. He is extremely grateful for all the prayers and good wishes he has received from everybody. Please continue to keep him in your prayers. Gerard at Mount Argus Parish let me know that Father Kieran was interviewed recently on RTE (Ireland) Radio; in the interview, he describes the experience of being shot, thinking he was dying, worrying about the effect this would have on the hospice, making an act of contrition…. To listen to this moving interview, click here, then scroll down and, under Audio & Video, click Morning Ireland. Father Kieran’s condition has changed and he is now in surgery. Blessed Charles, intercede for him.